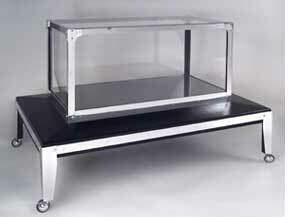 An open aluminum framework is wheeled out and shown on all sides. A sheet of clear Plexiglass is placed on the bottom and other sheets are placed into the sides of the framework. Finally, the last sheet of Plexiglass is placed on top. In all, six sheets are now in place, creating a sealed crystal casket. The casket is covered with a cloth and quickly spun around to show all sides. The cloth is then whipped off to reveal the assistant reposing inside the casket. The top sheet is removed and the assistant steps out.